Our first stop in Louisville was Churchill Downs. Now we are not actually fancy enough people to be fans of horse racing. As a matter of fact, before the trip I tried to get the kids interested in the Kentucky Derby to no avail. I talked about elaborate hats and famous horses and Middle just kept asking, “When will we get to the Seattle Seahawks stadium?” That’s what I’m working with, people. So back in May I picked up a movie to make the trip to Churchill Downs more meaningful to them. I tried to get the documentary Thoroughbred: Born to Run , but it wasn’t available at the local library. Then I hoped to borrow Seabiscuit or Secretariat but the only DVD on famous horses I managed to track down was the Disney flick 50 to 1. 50 to 1 is not Disney’s best work but it is about a redneck who kind of lucks into training a horse that lucks into a Derby run. 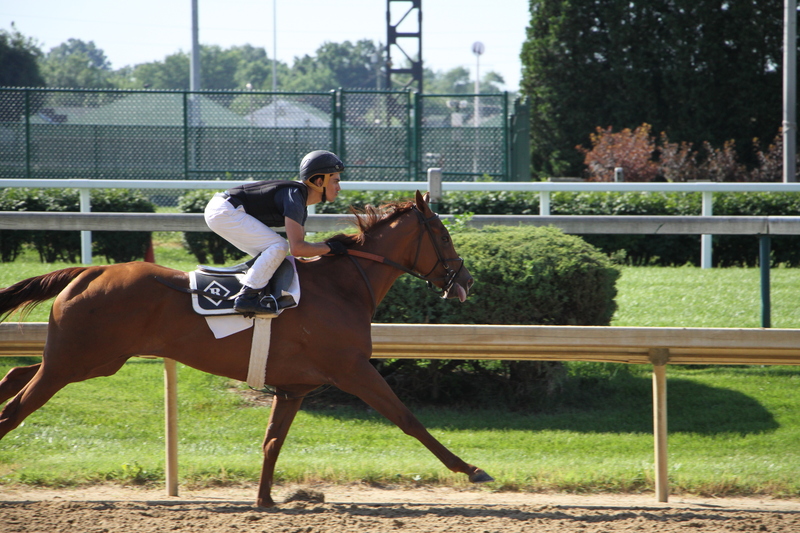 Since we can certainly relate to rednecks and occasional dumb luck, it was a good enough choice and it gave the kids some idea about horse racing as well as Churchill Downs and its storied place in the sport. It was also based on a true story so it counts as a documentary minus the boring parts. 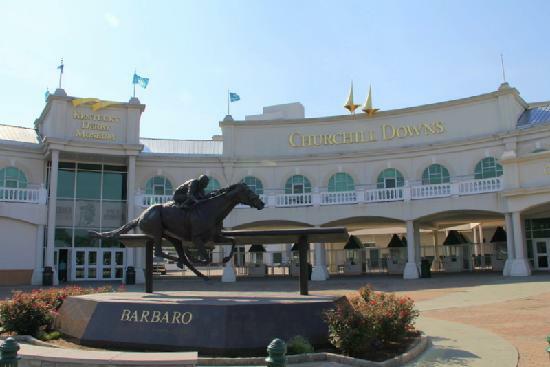 But after driving alongside lush green Kentucky pastures, miles of beautiful white fencing, and expensive horses frolicking in fields, it was a bit surprising to find Churchill Downs in the center of the city surrounded by low end neighborhoods and gravel overflow parking lots. However, the museum and the tour more than made up for what the location was lacking. 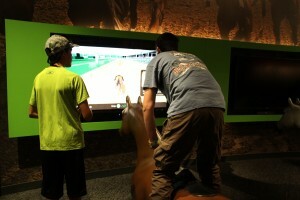 The Kentucky Derby Museum is located on the grounds of Churchill Downs and is as slick and shiny as a jockey’s silks. The exhibits are very interactive and family-friendly while still passing along a wealth of inside information about the thoroughbreds, horse racing, and the history of Churchill Downs itself. There’s an excellent 360 degree film which involves a screen surrounding the viewers and seats that swivel to follow the action. 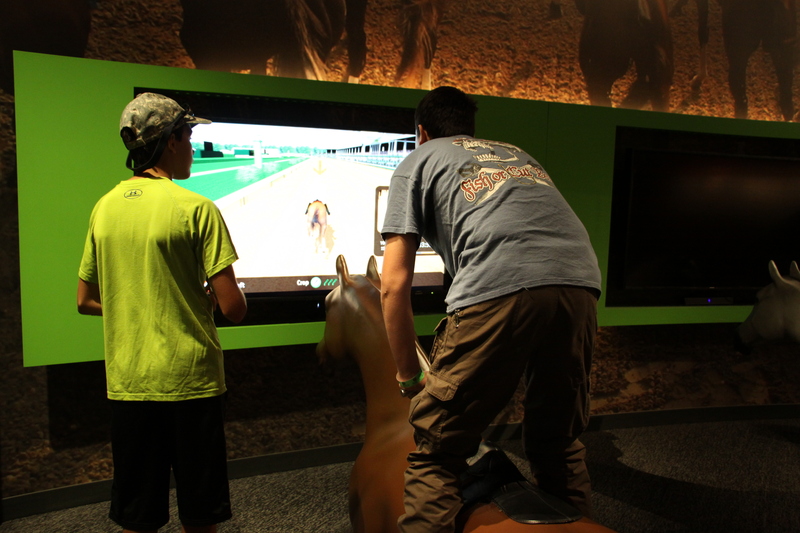 Of course, the interactive video game that allowed visitors to be the jockey in a 3 horse race and compete against other museum attendees was a big favorite. As an added bonus there were monitors that allowed you to view any of the previous Kentucky Derby races on a big screen. So we watched the 2009 race where Mine That Bird, the horse from the movie 50 to 1, ran for the roses and won it all. Which made all that movie-chasing before the trip worthwhile. And the displays on Secretariat and Seabiscuit got the kids just interested enough that they may sit though those movies, too, after the trip. During the Historic Walking Tour we passed through the paddocks and into the grandstands while the tour guide explained about the buildings and box seats, the races, the betting, the Triple Crown, and walked us through the places of the owners, jockeys, and horses on the big day. We didn’t stay for an afternoon race but during the tour several horses were working out on the track right in front of us so we felt like we still got the experience. Of course, throughout the tour, in the cafe, and in the gift shop there was a lot of talk about mint juleps. The Other Half looked confused and asked me, “What is a mint julep?” I laughed at him for being so uncultured and told him it is a famous Southern drink and is the unofficial drink of the Kentucky Derby. He asked what was in it and I told him but said I wasn’t sure if it was made with bourbon or whisky. Then he looked at me funny and told me bourbon and whiskey are the same thing. Wait, WHAT? If we were smartphone people I would have asked Siri about that craziness right then. But it was weeks later when I finally looked it up and discovered that, yes, they kind of are the same thing except bourbon is made in America in a different type of barrel and with a certain percentage of corn. I had no idea. I told you horse racing was too fancy for rednecks like us. Way out of our league, people. Out of our league. 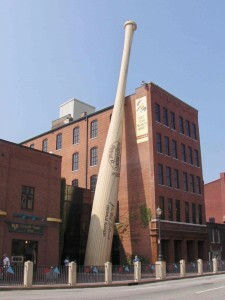 Speaking of leagues, when we left Churchill Downs we went a couple miles away to see the Louisville Slugger Museum. I’m not actually a huge baseball fan. I loved baseball when I was younger—-enjoying college games at my university, going to see the Cubs and the White Sox when I lived in Chicago, even taking in Durham Bulls games when they were an affiliate of the Atlanta Braves. Having a few beers, a couple hot dogs, and chatting in the stands in the summer sunshine deserves to be America’s pastime. As an added bonus, baseball games are so long and the action so short-lived that I could easily catch up on my friends’ latest news, adventures, and gossip without ever really missing anything on the field. Based on those fond memories, I thought it was a great idea when The Other Half signed the boys up for baseball. Too bad that baseball with children is nothing like baseball as a young adult. In the good ol’ days, before heading out to the ball field I had to pick out a cute outfit and do my hair. Now I had to track down 100 pieces of equipment and 3 baseball uniforms, in various stages of clean, dirty, or still in the washer/dryer, while also trying to pull together a dinner of which only 2 mouthfuls would be consumed before we went out the door, leaving all of the dirty dishes for when we returned, hot, sweaty, and 3 hours late for bedtime. Once at the ball field I was stranded on the sidelines with whatever child was bored and waiting to play or, even worse, shifting back and forth between fields to watch simultaneous games in progress. The huge number of players meant my children only got up to bat once or twice and would be weeping if one or both of those at-bats resulted in a strike out. Never mind the hours they spent in the outfield without ever seeing the ball at all. Oh, sure, there was plenty of time for chatting in the stands—-if you’re up for endless discussions of team politics and the poor sportsmanship of other parents while a whiny child (your own or one of the other many siblings suffering as a trapped spectator) circles your space, stomping up and down the bleachers, throwing rocks at people, or begging for treats from the concession stand. They do still have hot dogs but once you’re a parent of 4 children, there are no more discretionary funds for $5 hot dogs. They don’t, of course, sell beer or liquor, which would go a long way toward making the entire fiasco more bearable. And the sunshine was nothing more than than another reason to feel guilty for not putting sunscreen on my children and hoping their Hispanic heritage keeps away the skin cancer. During my third season of baseball, I was huddled in the stands at 9:45pm on a school night and wondering when baseball became such a miserable sport when I had a revelation. I was not actually a baseball fan! I just liked getting drunk with my friends! Aha! Like Aristotle said, Knowing yourself is the beginning of all wisdom. Which is why I started pushing for soccer at the end of that season. And I live quite happily now with spring soccer—-a team shirt, 1 pair of shin guards, 4 ten minute quarters, and we’re out of there. The kids can be home, showered, and in bed by 8 pm and I can be out the door to Moms Night Out soon after that. A win-win for everybody! It was quickly obvious that I was one of the few Americans parents who had a problem with baseball. The place was absolutely packed with families! My kids weren’t too interested in holding bats previously used by famous players or the signature wall. I made them sit through the 13 minute video about baseball which, in my opinion, was about 11 minutes longer than it needed to be (because they were not serving beer). The factory tour itself was great—we were just a few feet away from the workers and machines making the bats. We got to see the templates that are used to make bats to each player’s individual requirements, the burning brand, and the specialty coatings applied by hand. The guides provided a lot of information about bat construction and, although I winced when we were told that it took 40,000 trees to make one season of bats, the guide insisted that Louisville Slugger owned their own forests that were so well-managed they were never depleted. I’m sure that’s true. That’s really true. That’s true, right? 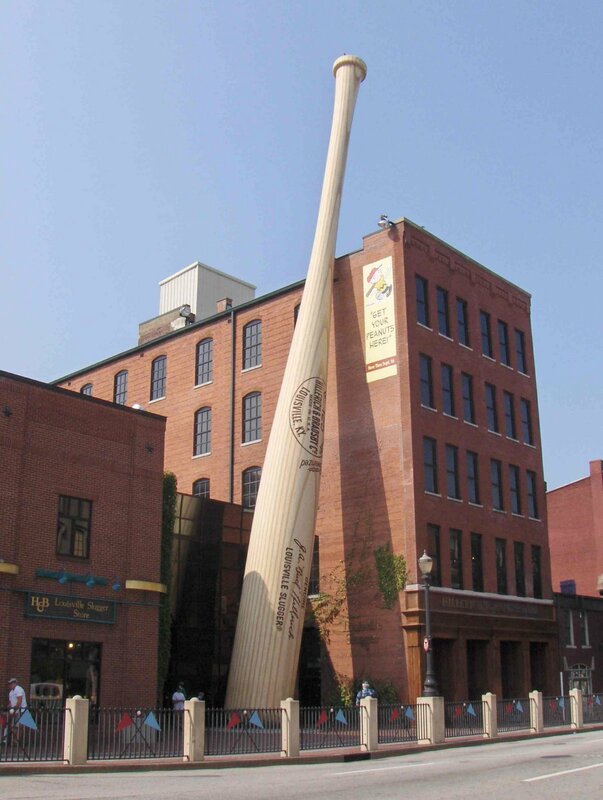 At first I thought the best part was that each kid got to take a home a mini-Louisville Slugger as part of the tour. That meant a souvenir that didn’t cost me an extra cent! Here’s the problem: if you are only about 500 miles into a 6,000 mile road trip with 4 kids trapped together in a minivan you do not want to arm them with small wooden truncheons. Just trust me on this. 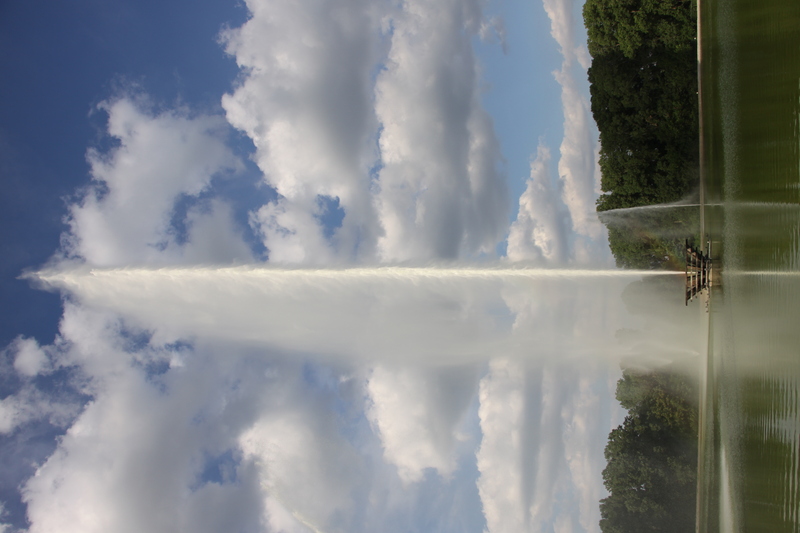 Our next stop was the Mississippi Overlook and Gateway Geyser in Missouri. I knew we wouldn’t hit St. Louis until after The Gateway Arch and Visitor Center were closed so we wouldn’t be able to go up the Arch or tour the museum. 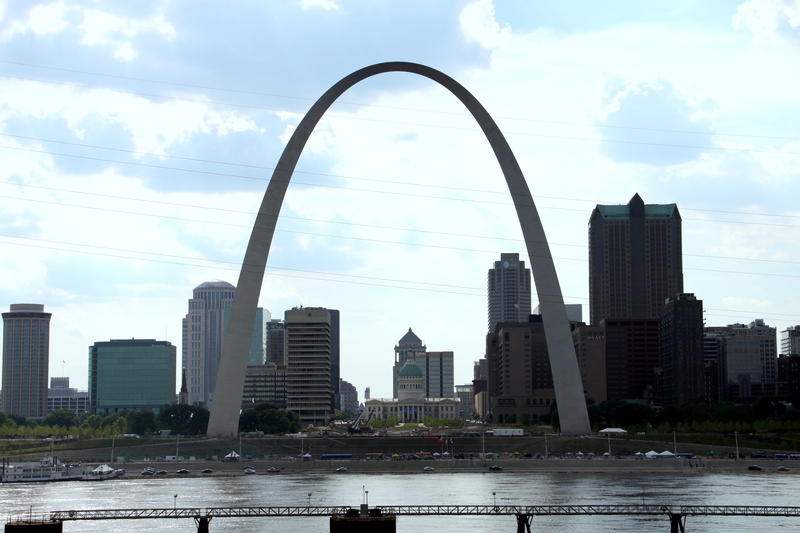 But, thanks to the internet, I found out there was a great park directly across the Mississippi river that gave a wonderful view of the Arch and bypassed driving through city traffic. 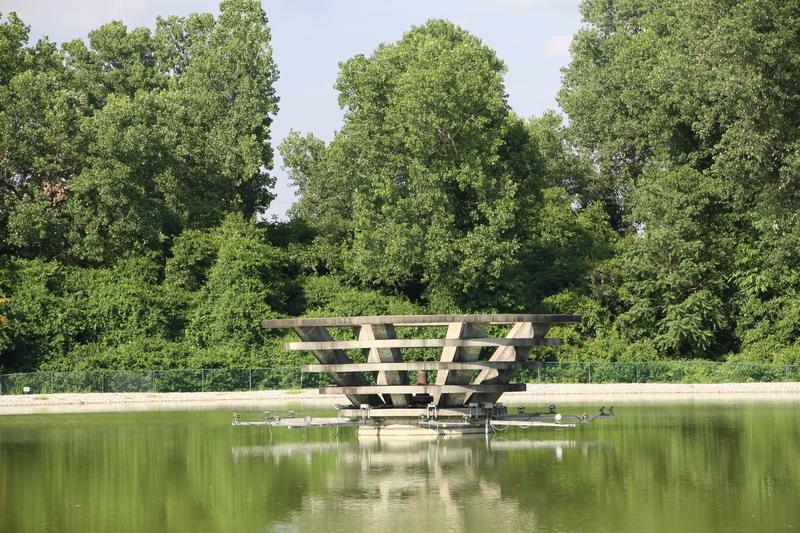 The park was an absolute gem with a clean bathrooms (you really begin to appreciate this on a long trip), a large grassy field where the kids got out to stretch their legs, and a huge zigzagging ramp (yeah, no stairs!) that led up 43′ to a great view of the Arch. 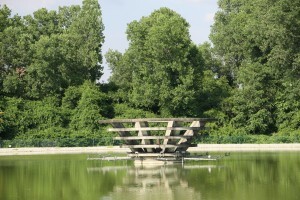 The viewing platform also has a camera which streams live to their webpage. So we were able to call my parents, have them log on to the webpage, and see us waving at them in real time with the St Louis arch behind us, while we chatted on the phone. You can even see what’s going on there right now, any day or time of the week. So you don’t have to settle for our vacation pictures—-you can see the Arch for yourself. 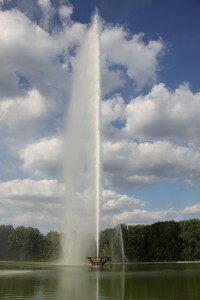 As an added bonus there was a geyser over a little pond on the second half of the park that was due to go off in about 30 minutes. It didn’t look like much but the sign promised it erupted to 630 ft. So the kids played some soccer in the park while we waited and it was well worth the wait! From there we headed for Illinois and as soon as the kids were tucked into their hotel beds (well, 2 in beds, 2 on the floor—redneck style) I went back out to the car. I found all those mini-Louisville Sluggers, wiped off the bloodstains, hid them in the trunk, and vowed that from that point on we were sticking to postcards as souvenirs! I LOVED the play by play of your trip. Brought back some wonderful memories of when my kids were younger. Did I say wonderful? Well, they were memories (bloodstains and all). I can’t wait to here about the rest of the trip. Finally!! Another parent who agrees we need to serve alcohol at those little league games! !